Who likes to win something for nothing? Who likes a good ol' book with lots of project ideas? I know I do! Here's your chance to win Better Homes & Gardens' 501 Decorating Ideas Under $100. DIY Vintage Chic's Sweepstakes begins Friday, February 8th at 12:00 AM Central Time and the deadline to enter is February 18th at 11:59 PM Central time. Winner chosen randomly. 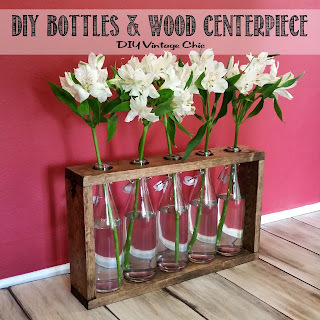 Rules: Must become a follower of DIY Vintage Chic either through Linky Follower or Network Blog and complete the Sweepstakes Entry Form (email address required). 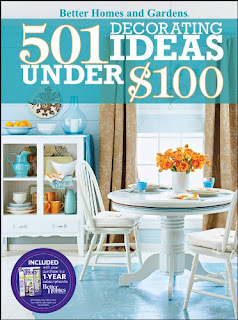 One point will be awarded for completing the Sweepstakes Entry Form and for following DIY Vintage Chic's blog. *Announce the Sweepstakes on Facebook, Twitter or Pinterest and earn an additional point (entered once every a 24 hours on each social media site). Tag DIY Vintage Chic so I’m able to track these posts. You can also mention the Sweepstakes on your blog or website once every 24 hours for one entry point. Please send me a link to your blog/website. Contact me (email, Facebook, etc) if you already follow DIY Vintage Chic on one of these pages. The winner will be contacted February 19th via the email address submitted on their entry form. (So make sure it’s correct! And check your spam/junk folder on the 19th!) The winner will have 3 days to respond. If no response is received by DIY Vintage Chic then another winner will randomly be chosen and given three days to respond. Contest open to residents of the U.S. only, 18+. Winner must claim prize within 3 days of being emailed. Hey Tamar, thanks for the info. I wasn't aware of any issues with Network Blogs. I'll look into it. Don't forget to fill out an entry form! I follow on Networked Blog (Pamela Halligan) and filled out Sweepstakes Form. Thanks Pam! Don't forget to fill out the Entry form! I follow on Google + (Pam Halligan).